You just can't make this stuff up. 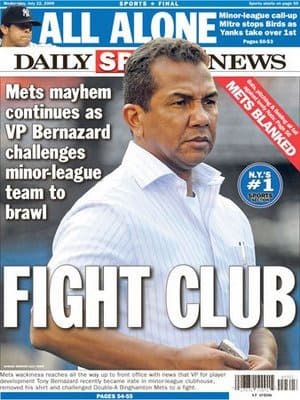 While giving the Double A Binghamton Mets a scolding after a 1-6 homestand, Vice President of Player Development Tony Bernazard ripped off his shirt and challenged the young players to a fight. His roid rage-esque tirade led Bernazard to get fired shortly after. But hey, Jose (and Ozzie) Canseco's boxing; he can always fall back on that.